OMG Posters! 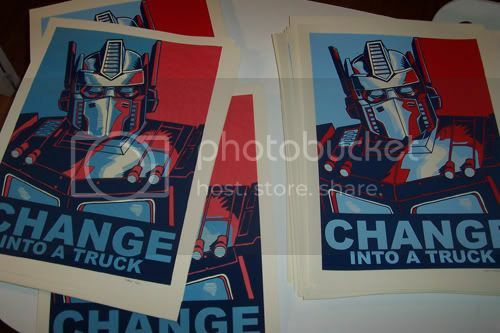 » Archive "Change Into A Truck" by Tim Doyle (A/P Edition Onsale Info) - OMG Posters! Tim Doyle is going to drop the LAST copies of his “Change Into A Truck” art print later today. He will have a few artist proof copies to sell, but there won’t be many. They will be $60, and will drop today (Thursday, March 12th) at 1pm CST. Visit NakatomiInc.com. I don’t know how many were available, but these sold out in under 5 minutes. All originals orders shipped today!